Forget country cottage weekends in the UK; if you really want to broaden your horizons, the only way is Prague. The Czech capital is fast becoming one of Europe’s trendiest city break destinations, thanks to its jazz scene and strong pub culture, but there’s also plenty of history to uncover once you know where to look. Many of Prague’s most talked about sights are in this part of the city, such as the Astronomical Clock at the Old Town Hall, Franz Kafka’s birthplace and the Charles Bridge. As with any tourist-heavy destination, you may find it tricky to combat the crowds in peak times, so it’s best to watch the clock chime in the early morning if you want to get a good view of this unique spectacle, which includes appearances from the 12 apostles and Death himself. Afterwards, explore the Old Town Square and the narrow streets that run off from it, full of boutiques and cafes. The Jewish Quarter, or Josefov, is foodie heaven, boasting everything from classic pubs to luxury restaurants. You should explore the cobbled streets before you choose your lunch venue, as there’s history around every corner, from the Jewish Museum to the synagogues. If you’re short on time then grab a snack at the ever-popular Bohemia Bagel during your walk (found on Masná 2); alternatively, savour the art deco feel and the tasting menu at the Sarah Bernhardt restaurant (U Obecního domu 1080/1), named after the actress who appeared in several posters by Czech artist Alphonse Mucha. You can even buy tickets to Mucha’s nearby museum in the New Town, which is well worth a visit for its Art Nouveau vibe. Step into the Lesser Town, or Malá Strana, where you’ll find the city’s famous castle, which is an essential pit-stop for any self-respecting tourist and is a UNESCO World Heritage site. Whether you want to watch the changing of the guard, see the crown jewels or discover paintings by old masters, there’s plenty to keep you occupied within the grounds. If castles aren’t a big draw for you and you’re more tempted by modern attractions then you might prefer to seek out David Černý’s conceptual art sculpture, Quo Vadis – a Communist-era Trabant car with legs. It pays tribute to East Germans who sought political asylum at the West German Embassy back in 1989. Continue your modern art tour by stopping at Lennon Wall (Velkopřevorské náměstí), which is a graffiti-based reminder of John Lennon’s life and his peace activism. The wall art has been constantly evolving since 1980, with the original Lennon wall portrait hidden under more recent scrawled additions from tourists and locals. The New Town Brewery is the perfect place to enjoy Czech food and, of course, a glass of Pilsner beer, but it’s also very popular for nights out, so it’s best to make a reservation. Follow up your meal with a quick 20 minute tour of the brewery, available after 6pm, to see how they manage to make it taste so good. Just as the place begins to get really busy, leave the revellers to it and head for the bright lights of Prague’s best music hubs. Even if you’re not normally a jazz music fan, the city’s intimate clubs and talented live acts may well change your mind. Soak up the atmosphere in Reduta, one of the most renowned venues, which has been bringing music to Prague since 1958 (found at Národní třída 20). There’s entertainment every night, covering more than just jazz – expect to find anything from swing and blues to reggae and cabaret being performed. For advice on where to stay in Prague after your jazz club experience, click here. Start off with plenty of fresh air and a stroll across small parks that are scattered around Petrin Hill. Don’t get too comfortable, as you’ll need plenty of energy to climb the 299 steps of the Observation Tower, which is a quirky tribute to Paris’ Eiffel Tower and can be reached by travelling on the funicular railway from Ujezd. The views from the top certainly won’t disappoint, with the chance to see the country’s highest mountain, Snezka, on a clear day. The area that used to be King Charles’ personal vineyards is now an up-and-coming part of the city that is very family-friendly and has plenty of good value places to eat, from pizzerias to casual coffee shops where you can people watch in peace. Try Pradelna Café, which used to be a laundry, where you can pick up a steaming bowl of soup, a homemade slice of cake or one of the speciality loose leaf teas. End your trip on a high note by cruising along the Vltava on a rowing or pedal boat in the summer, allowing you to choose your own route. There are rental areas by the National Theatre and also by the Charles Bridge, which tend to be open for business between April and October. Seeing the city from the river will give you a totally different perspective and you can test your skills as a rower. By following this guide, you’ll get a good grounding of Prague’s best sights in just two days and you’ll know why it’s so popular for weekends away. 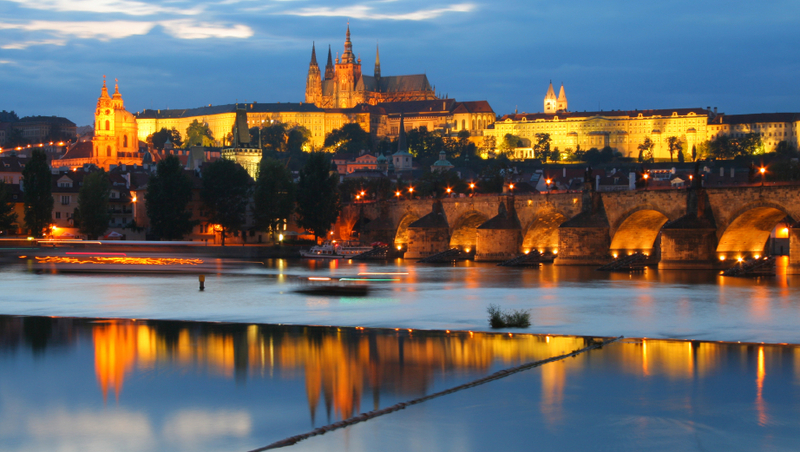 Find out more about Prague breaks and get planning your escape to the Czech Republic. Tagged europe, prague, travel. Bookmark the permalink.